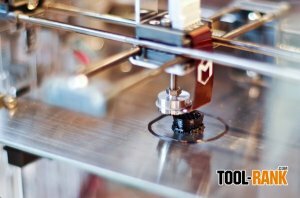 $350 is cheap when it comes to 3d printers and I wanted to know if I could get a return on my investment. Could the value of the things I print actually equal and exceed the cost of the printer? I have my doubts, but I still want to give it a shot. At least I will learn about something new during the process, and I might even have fun doing it. So how is it going so far? Like most 3D printer owners, I seem to be printing items to make my 3D printer even better. After printing out some test cubes and some brackets for another Tool-Rank project I am working on, I am currently printing out a camera bracket that will allow me to view my 3D Printer remotely. With it I can monitor my printer in the workshop from inside my house. Printing out decorations is fun and all, and some are really impressive, but I want to print out things that are actually useful. So if you have any ideas, feel free to let me know. One of the harder things for me will be making the 3D models. Wish me luck.